Yesterday, we highlighted a measure of money flow that suggested short-term bullish sentiment may be getting a tad bit extreme. Today, we look at another series currently indicating a potential elevated extreme in stock investment – only from a longer-term perspective. Investor stock allocation in the survey, which began just after the crash in 1987, has ranged from a low of 41% at the depth of the financial crisis in early 2009 to a high of 77%, hit at the peak of the dotcom bubble in early 2000. 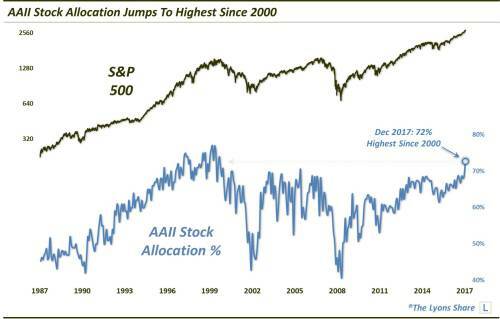 Interestingly, despite the post-2009 bull market’s relentless ascent by stock prices – particularly in recent years – AAII stock allocation has remained relatively subdued. It’s high during the past 9 years was “just” 69%, registered in late 2014 and early 2015 as well as a few times last year. We say “just” because, while there have certainly been elevated readings on a historical basis, we would not characterize any of them as “frothy” by any means. Until, perhaps, now. The December reading of the AAII stock allocation jumped from 69% up to 72%. 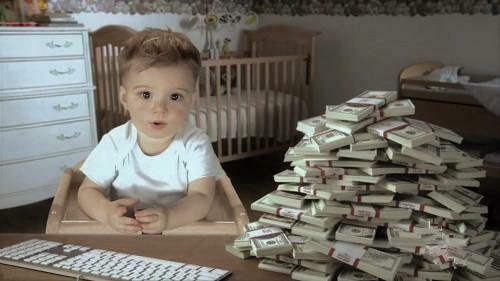 That marks the highest level of stock allocation since the heady days of the 2000 dotcom bubble. Furthermore, the 3% jump in allocation was the largest monthly increase in 4 years. Thus, you have an elevated and accelerating degree of bullishness – a possible indication of the froth that has remained largely elusive despite the recent record-breaking rally.